Throughout my career I’ve been fascinated by how people engage with each other in business. I’m always up for trying those personality studies and tests to try and figure out my business profile and where I best fit into an organisation. I trained thousands of employees at SAP to build their personal brand online as part of a huge global effort to shift the organisation to become a social business. 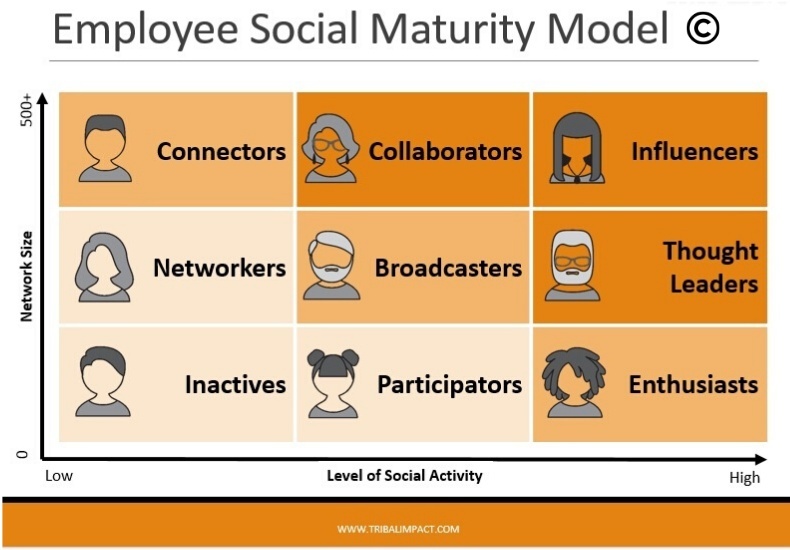 During that time I noticed that employees broadly fell into different categories of social maturity largely driven by the extent to which they network and how digitally active they were with their brand. This isn’t a scientific study by any stretch of the imagination nor is it a hard and fast categorisation. It’s more a reflection of 7 years’ experience within a field of work that I feel passionate about - employee social advocacy. I’d be interested to know what other people think about this. Can you overlay your employees on the model? I’ve broadly mapped employees to a model that looks at the extent to which they network against their level of social activity. When mapping employees to such a model it’s easier to target the right developmental steps to help them advance – if they so wish! Generally speaking, the higher you are in the model the more connections you are likely to have and the more active networker you are. Employees that sit further to the right of the model tend to be more socially active e.g. blogging, tweeting, engaging with influencers. Employees are unlikely to sit clearly in one box or another. They may demonstrate behaviours from multiple boxes. Most will recognise where they sit from the definitions below. Whilst it’s a fairly basic set of axes, it does determine a natural path of progression for a social employee. By deconstructing what it takes for a person to become an influencer online, I have been able to create a social training experience that maps to the natural journey. This is great for the employer since the most appropriate training can be targeted to the correct group of individuals. It’s also great for the employee because they’re not overwhelmed by “Twitter 101” training when they haven’t even got a LinkedIn profile! Inactives don’t have much of an online presence. LinkedIn is normally activated only when they’re looking for a new job – it’s considered nothing more than a digital version of their CV. Traits include an incomplete LinkedIn profile, perhaps no photo and a very low number of connections. However, this group may be very active on social networks that would be considered more personal e.g. Facebook and Instagram. This group are typically more active on LinkedIn but no other platform other than personal social networks. They will often accept invitations online and may even occasionally send invitations to others. In my experience, many B2B sales teams sit into this category – historically good networkers offline but limited experience online. These folks aren’t just networkers – they’re connectors. They have a large network on LinkedIn and always know someone who knows someone else who can help. They actively connect people together because they know that sharing is caring. They don’t have an agenda and they don’t expect anything in return. They just do it because it’s in their nature. Whilst this group still has a relatively small network, they are beginning to dabble in social networking. They are testing the water by engaging with others online e.g. liking and commenting on content. They are a group to watch since they are naturally curious but probably don’t have some of the basics in place yet e.g. a good network. Folks in this category are showing more social potential. Perhaps they’ve been “dabbling” for some time by engaging with other people’s content and are now starting to share other people’s content to their network. Many organisations that implement employee advocacy tools serve this space perfectly – employees are provided with “corporate approved” content to share but without contextual training it can often look like your employees have become another broadcasting channel. As sharers increase their network you tend to see a behavioural change. They broadcast less and appreciate feedback more. Typically folks in this space have a large network, they’ve been through the engaging and sharing stage and are now starting to formulate opinions themselves and seek to listen to others. This groups tend to be highly active on social media. Anyone this far right on the model will be actively out there creating their own content and formulating their own opinions. However, they may have a relatively small network. In my experience millennials typically fit this profile, joining the workforce with a strong social acumen but with a limited professional network. Watch this group carefully. Opinionated enthusiasts that aren’t engaged at work can cause issues, while those that are engaged are potentially strong advocates. This group tends to be considered the knowledge experts within an organisation e.g. product marketing, pre-sales, sales consultants and they hold an enormous amount of credibility with customers. They don’t actively network (often they don’t have time) but they may blog or tweet when they can. Enabled and engaged, this group has the potential to set your organisation apart from the competition, by creating content that will attract digital audiences. This group are highly active networkers and content creators. Social has become part of their daily routine – part of their DNA if you like. They are considered influencers in their field, formulating opinions and writing content that sets them apart from their peers. This category of social employee (along with Thought Leaders) will attract customers to your brand online. Make sure these folks are engaged in the company – give them influential opportunity, seek their feedback, promote their content! 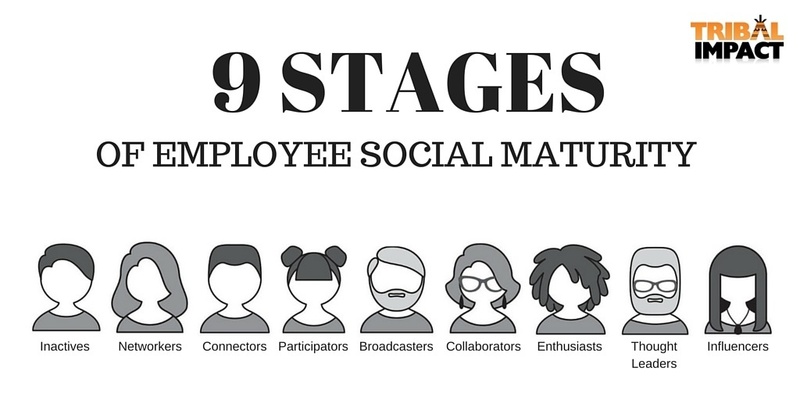 So there you have it – my 9 categories of employee social maturity. 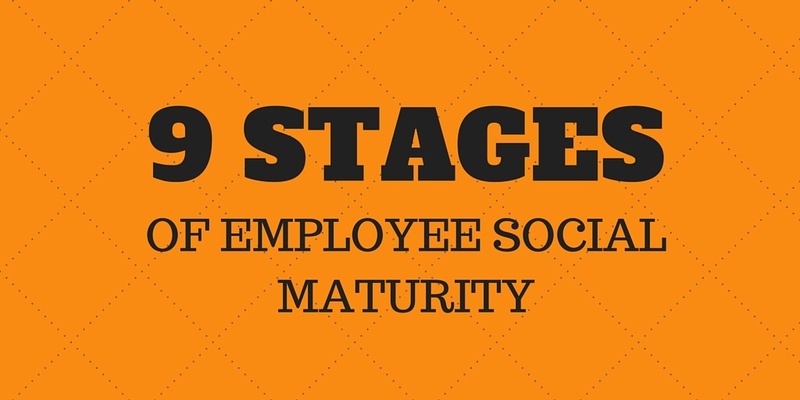 Once you’ve mapped your employees to the maturity model it’s easy to pinpoint the appropriate training to deliver.